As featured in Mashable, the #1 app for managing your babysitters just got even better. Book and pay your own babysitters instantly, then find new babysitters through friends or in your neighborhood, hassle-free. Want to always get a sitter when you need one? The secret is to build a team of sitters you trust. Sitter makes it ridiculously easy. Created by parents, Sitter takes all the hassle and annoyances out of using and finding babysitters. 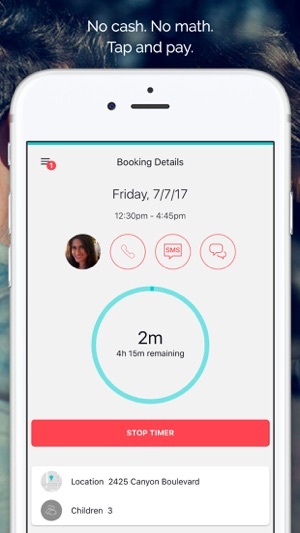 With the tap of a button, you can book your favorite sitters, manage the info they need from emergency contacts to bedtime routines, and pay them! 1. Import your sitters' phone numbers from your contact list. It’s completely private! We don’t share their info or spam them. 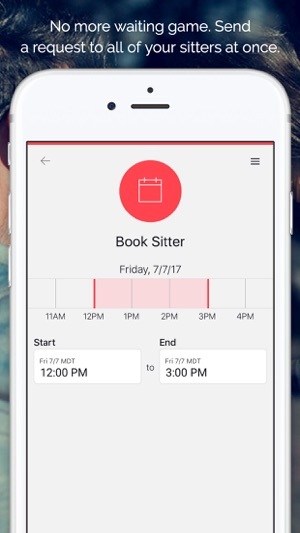 Sitter sends a message to your sitters with the details. They reply with a “Y” or “N” to accept or decline. The first one to accept gets the job! They don’t even need the app! At the end of the night, confirm the amount and tap "Pay". You’re done! When you need to hire a new babysitter, the best way to find them is through friends. 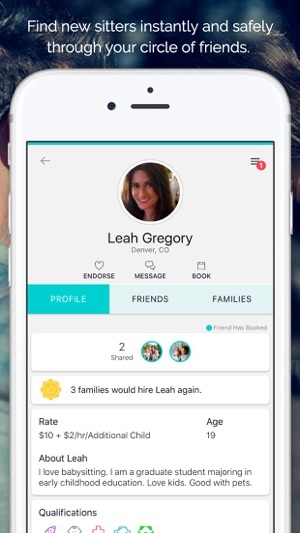 Connect with friends to create a private network of parents and trusted sitters, so you can find new sitters quickly, based on your friends' recommendations. New to an area? Find sitters in your neighborhood too! • Use it with sitters you already know and love from Grandma to the neighborhood teen - they don’t need the app! • Sitters you use have info they need such as emergency contacts, allergies, and bedtime routines at their fingertips. • Send a request to all your babysitters or just your favorites. • Manage your nanny’s schedule with repeat bookings. • Add notes to a booking so your sitter knows exactly when to take Johnny to soccer. • Pay your babysitter securely using any major credit card - they get a direct deposit. • In-app timer keeps track of time and calculates how much you owe. • Get names of new sitters from friends in the app. No more remembering where you scribbled that sitter's name. • Hide a sitter so you don’t have to share Grandma with friends. • Keep track of all your babysitting gigs and quickly pull up directions to their house. • Don’t worry about remembering everything - emergency contacts, allergies, and bedtime routines are at your fingertips. • Get more babysitting jobs through people you know and trust. • Want to find families in your neighborhood? You can! And you can feel safer knowing your profile is only discoverable by families in your neighborhood who have complete profiles. It’s never public. • Get paid by credit card. The money gets deposited directly to your account. Ka-Ching! • Keep track of your families’ names and contact info. • Receive instant notifications, reminders, and messages from parents. • Long night? Easily keep tabs on how much time you have left until the parents come home. Whether you’re going out for a night on the town, or just need to get stuff done, kid-free, Sitter has your back. Sitter helps babysitters find jobs and is the best babysitter app for parents looking to hire, book, or pay a babysitter. Ditch the excuses. If you’ve got Sitter, you’ve got a babysitter waiting. It’s time to go out. We love to hear from you! We want to build a product you love so contact us with any feedback. This app has been amazing for scheduling. I just wish it would let me block out days I know i won’t be available so that the family can’t even request it. For that day. It would maybe then send the request to the other sitters. Would make it easier then trying to verify my schedule before accepting the request if I already had the days I couldn’t blocked out. I also wish there was a way to review all my payments easily instead of having to go through all past bookings. Other than that this app has been amazing. I seriously love this app. Being able to notify all sitters at once is awesome and so convenient. It’s really great. When we can we try to use his or my parents but when they are u available I can message all my sitters simultaneously and not have to wait for one to respond before reaching out to others. I get much faster childcare coverage than traditional methods of phone chaining. As a stressed-out new mom, I was desperately trying to find babysitters to help me. I paid about $8 for 1 week to be able to contact possible sitters. Tried contacting 4 potential sitters and NONE of them answered. I then gave up. The developers really should delete inactive sitters or have a note in the app stating how long it’s been since a sitter signed in. As a new mom, I don’t have time to send 50 messages to people that may not even be active anymore. What a waste of time and energy (which I have so little of right now to begin with). Thanks a lot for wasting my time, money and adding to my stress! Hi - I'm sorry that Sitter didn't meet your needs. I know how frustrating it can be when the sitters don't respond and how challenging finding sitters in general is. While we don’t manage the babysitters directly, we do take these things very seriously. If you could email us at support@sitter.me so we can locate your account, we'd be happy to provide you with a refund for your purchase.